If you recall a 2015 announcement by NASA celebrating the discovery of liquid water on Mars seeping down dusty slopes in dark streaks, you may remember a hubbub of excitement over the possibility of finding life-friendly environments there. The study looks at 3D topography data from NASA's Mars Reconnaissance Orbiter to explain the streaks not as flowing water stains, but as downhill flows of sand and dust--and has thrown a dry blanket over the quest to find life-friendly environments on Mars. It's also a reminder that the walk of scientific exploration is often slow and ponderous, replete with unexpected twists and turns along the path, false trails, and dead ends. Mysterious Dark Streaks—Wet or Dry? 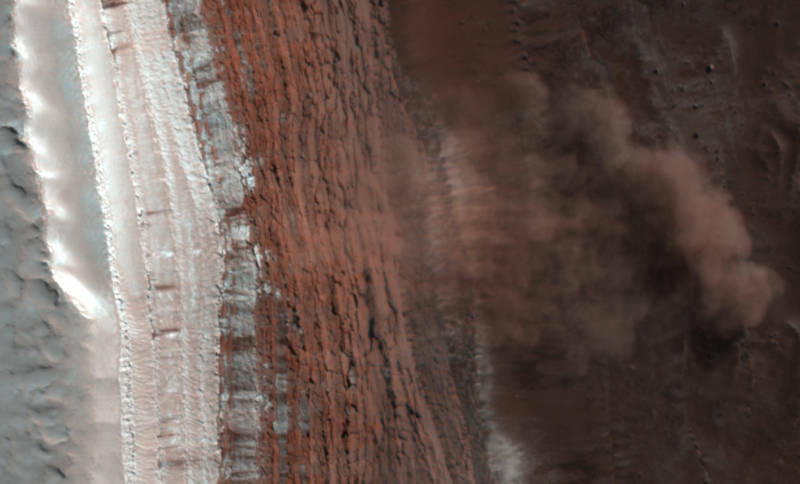 The mysterious downhill-running streaks were discovered in images captured by NASA's Mars Reconnaissance Orbiter in 2011, and stirred up a lot of excitement. The streaks, called "recurring slope lineae," seemed to indicate the potential that liquid water flowed on Mars, and raised the possibility of environments suitable for microbial life. Since their initial discovery, scientists have observed thousands of these streaks in dozens of sites ranging from Mars' equatorial region to mid latitudes. The behavior of the streaks looks similar to seasonal snow-melt runoff on Earth, appearing only during warm seasons, growing gradually in the downhill direction in stripes 2-15 feet wide and hundreds of feet long, and then disappearing when the active flow is over. Then, in 2015, NASA's Mars Reconnaissance Orbiter detected the presence of hydrated salts in one of the streaks--an unambiguous signal that water, if only in the form of mineral-bonded water molecules, was a player in this mysterious drama. The discovery not only showed that water molecules were present, it provided fuel for scientists trying to explain how any liquid water could exist under the conditions of Mars' cold, dry, thin atmosphere. While fresh water should freeze to ice or evaporate into a gas in the Martian desert, salty water can act like an antifreeze, possibly allowing water to flow as a liquid brine for a time. Flowing Behavior More Like Sand? The newer research examined 151 recurring slope lineae using 3D image data obtained by the HiRISE camera on the Mars Reconnaissance Orbiter. Analysis revealed that the streaks only appear on slopes steeper than 27 degrees. This small fact is dramatic because that exact degree of slope is the tipping point when a pile of dry dust and sand lying stably on a hillside begins to slide and cascade downhill. This is called the dynamic "angle of repose." The streaks appeared on the steeper slopes, but stopped upon reaching inclines of 27 degrees or less. If flowing water were driving the action, the streaks would not be halted by the gentler slope and would flow on. 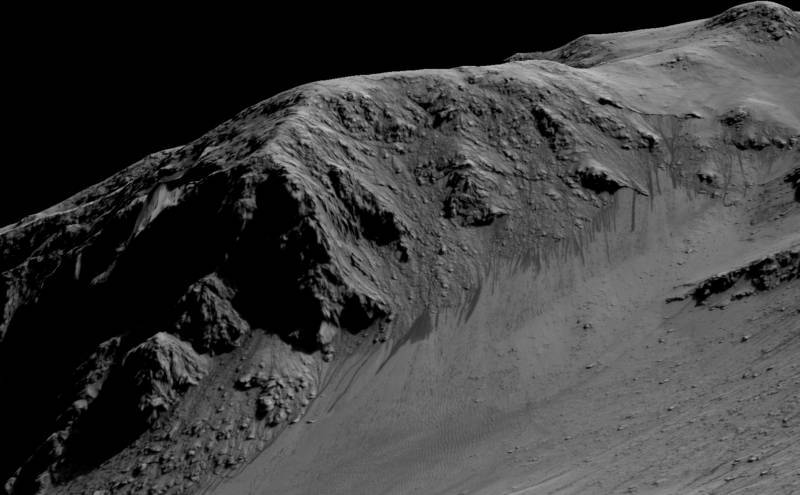 Have Visions of a Watery Mars Dried Up? While the preponderance of evidence gathered by multiple robotic orbiters, landers, and rovers still tells us that, in Mars' past, liquid surface water was widespread and long-enduring, the search for moisture on Mars today remains a bit of a cat-and-mouse game. A vast amount of frozen water exists on Mars, under the dusty patina of the flat northern plains and piled up in the polar ice caps—remnants of rivers, lakes, and seas in Mars' warmer, wetter past eons ago. 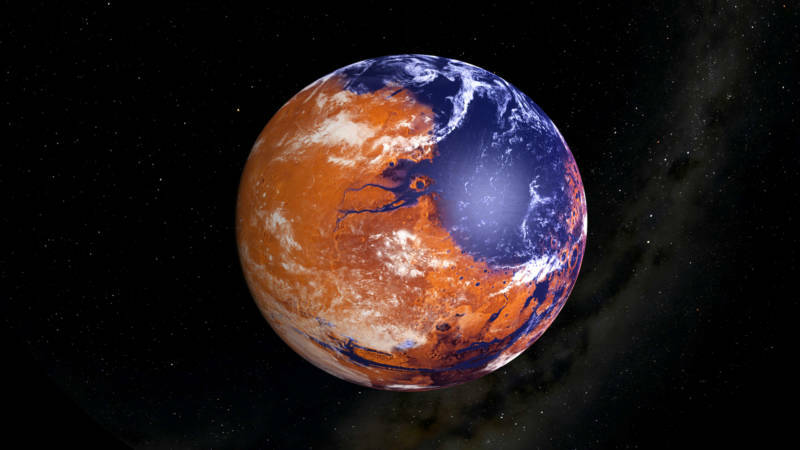 As Mars lost the atmospheric swaddling of its youth—through processes under investigation—its water became locked up as ice or evaporated into the thin atmosphere as water vapor. Today, the environment on Mars is far drier than the most parched desert on Earth, where one can still expect to find a bit of morning dew. A Unique Phenomenon of an Alien Environment? But the mystery of Mars' seasonal dark streaks is not completely solved. Questions remain. Why do the streaks appear only in the warm season, as if triggered by a changing environmental condition? On Earth, seasonally occurring landslides are usually associated with water—precipitation or snow melt causing a hillside to slough off under the added weight and softening soil. 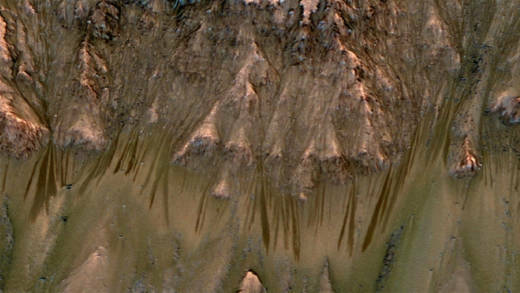 Why do the Martian streaks appear to form gradually, like the slow seeping of water, and not in one quick slide of sand? Landslides of dry dust, soil, and rock on Earth tend to happen in rapid bursts, and then are done. How does the presence of hydrated salt minerals in the streaks fit into the puzzle? Are salt-bearing soils, upturned and exposed to the atmosphere in a natural landslide, chemically drawing water molecules from the air, as salt tends to do? Or does the hydration of soil salts, maybe driven by elevated seasonal humidity, somehow trigger a slide? Why do the dark streaks then fade, as if drying up? Really good questions. Scientists are looking for answers. The more we learn about the phenomenon, the more it seems that it may be a uniquely Martian thing, the likes of which we don't find on Earth. Further observations from orbit may help us solve some of these riddles, but the best way to see what is really going on would be to send a lander or rover directly to an area with RSL activity to do some first-hand digging. This would be a special challenge since these streaks appear only on steep slopes, terrain that we have never attempted to land or drive a robot on. Still, getting there could answer a lot of intriguing questions.